Today marks the beginning of the “Battle of the Bay” regular season contests between the Oakland Athletics and the San Francisco Giants. They are always intense games, more so for the fans than the players. Dave Stewart. Game 3 1989 World Series. Otto Gruele Jr./Getty Images. Both teams have passionate fan bases (although one team’s fans are much more knowledgeable than the others) and the cross-bay rivalry always gets heated. It’s been a battle since the original “Battle of the Bay” World Series in 1989. The Athletics swept the Giants in four games. Many a Giants fan will blame the enormous earthquake that rocked the Bay Area just before the beginning of Game 3 as the reason their team lost. 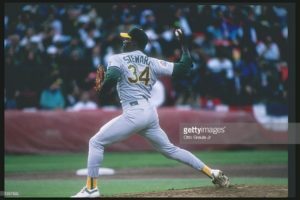 Many have told me that it was unfair because the A’s were able to use their top two starters twice; Dave Stewart and Mike Moore, due to the 11-day break the series took so the Bay Area could begin to recover from the death and destruction the earthquake brought with it. Still, the A’s would have likely swept the Giants anyway as Keown indicates. The 1990 AL Cy Young Award winner and the last pitcher to ever win at least 25 games in a season, Bob Welch (he won 27 games in 1990), would have pitched game three and likely taken home the win. Things have changed in the Bay Area since then, but the rivalry has not changed. One game out of four is already in the books with the Athletics winning by the score of 8-3 but there is plenty more Bay Area baseball to play! For a full preview of this week’s Battle of the Bay on BBST CLICK HERE! We’ve seen this movie before – it’s an even year and the San Francisco Giants are one of baseball’s best teams. Should we just hand over another World Series trophy to them and get it over with? There are quite a few teams out there begging to differ – mainly in Chicago, Texas and New York, among others – but it’s hard to ignore the even-year trend going on in the Bay area. Whether the organization puts any stock into it or not, nobody can deny they’ve come out swinging since the end of last year. Not only have they locked up homegrown players like Brandon Crawford and Brandon Belt to affordable long-term deals, they bolstered big needs in the outfield with Denard Span and the front of the rotation by flanking Madison Bumgarner with Johnny Cuetoand Jeff Samardzija. As well as the Giants have played through the first two months, things are about to get more difficult. Like most contending teams, there are concerns about specific parts of the roster. With outfielder Hunter Pence anticipated to miss at least two months with a hamstring tear, those concerns are only amplified. The Giants were uncharacteristically one of the top spenders this past winter by committing nearly $300 million to Cueto, Samardzija and Span, but it probably won’t be enough. There doesn’t appear to be a lot of opportunity in the trade market this summer, but if they want a chance at continuing that even-year trend, they’ll have to once again make big splashes. Why Is The Deal Between The Los Angeles Angels And Tim Lincecum Taking So Long? Which team will sign former Cy Young Award winner, Tim Lincecum? It is a question many baseball fans have been pondering for weeks. It looks like we could have an answer very soon. It was reported a few days ago that Lincecum signed with the Los Angeles Angels, but there is no finalized answer quite yet. The deal is pending a physical, but it has been nearly three days since hearing any verdict of the final decision.